Updated to version 1.2. Corrected issue where players in NCAA and USSDA were going on holiday/vacation before the Championship competitions. Also added the new Fresno FC franchise to the USL. New changes have also been made to the graphics file, which has been re-uploaded. Managed to get through the preseason slate without a loss, but it is somewhat concerning that we drew with 2 of the 3 MLS clubs we faced. RSL scored the equalizer in the 85th minute, DC in the 75th. I'm not going to get too worried yet, but definitely it causes me to be a little worried going into the MLS season. 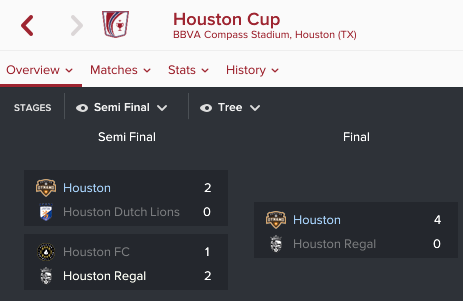 The Houston Cup was just a silly little friendly cup that I arranged with some of the local clubs. Was actually easier than it looks. We added to our trophy case by winning the Desert Diamond Cup preseason tournament. Should have had maximum points but blew that game against RSL as I stated. These two Designated Players are going to make us a formidable club this season. Obviously they would normally go against my transfer policy, but this is a big rebuilding season. I've brought in a lot of young players but they're frankly not ready to carry the team yet. Guys like Para, Debuchy, and Podolski will keep me winning matches while we develop those youngsters. In 2018 I don't plan on bringing in aging stars. Overall this is better, and deeper squad than 2016. Most of the second team players will also be guys who we believe are going to develop into stars rather than guys who are occupying seats on the bench. That first team is pretty sick. And I'd actually put my second team up against a lot of MLS teams. I feel good about my squad and what I'm really looking forward to is the knockout stage of the Champions League at the beginning of next season once all those early-twenties have had a year to develop. Somehow the media is predicting Beckham's squad to win the league in their first season. I looked at their squad and I simply don't see it. They're in the Eastern Conference, which means I wouldn't really have to worry about them until the MLS Cup anyway. According to the oddsmakers My biggest competition is going to come from the LA Galaxy and Seattle Sounders. After Seattle there's a pretty big dropoff. 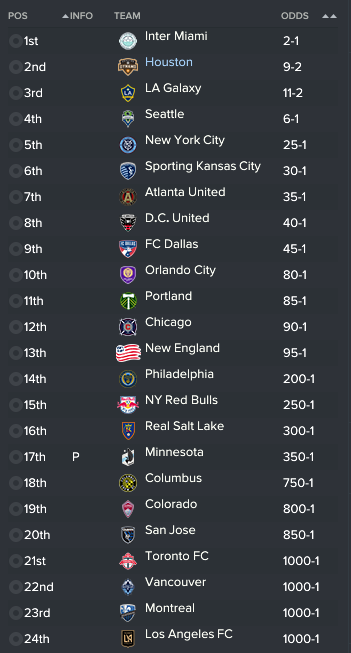 I refuse to count out Sporting Kansas City, they pushed me to the final day last season for the Supporters Shield. We did place two on the Preseason Media Dream Eleven. Both are newcomers; Lucas Podolski and Para. On the key players list we also had Erick Torres. So enough's enough, it's time for season two. I'm shooting for 75 points in MLS play this season. That would easily beat the record of 68, which I tied with last year. 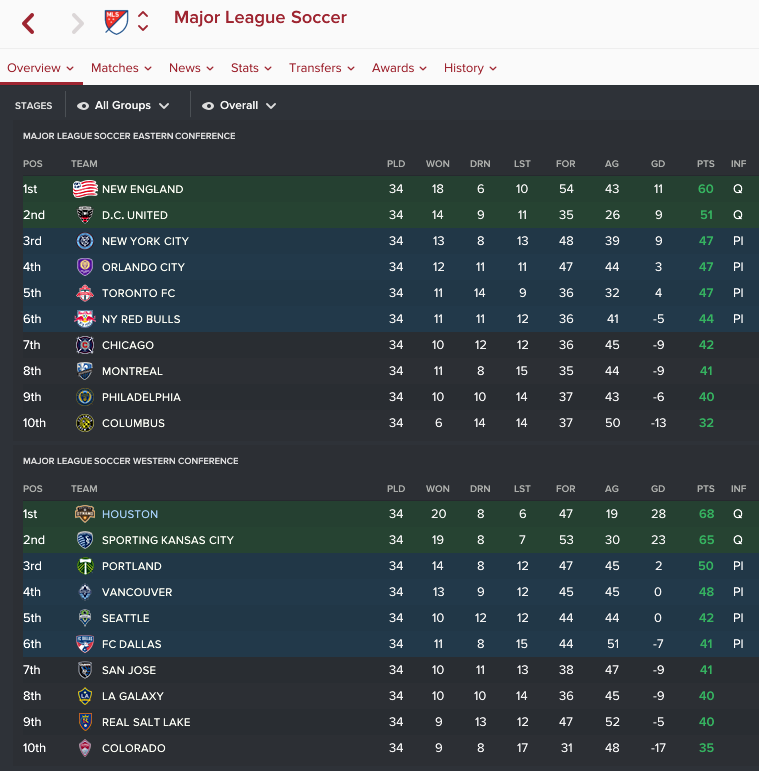 Obviously I want to win the Open Cup again, and I want to take maximum points from Champions League group stage play when that rolls around in the fall. The tour of Brazil went swimmingly. All wins, and we got a good look at our lineups for the 2017 season. We opened with a 2-0 win at Bragantino, and the a pair of 3-0 wins against Linhares and Botafogo (SP). In the final match at Olaria we faced our first bit of adversity when we gave up a penalty in the 7th minute. The lads fought back and we walked away with a 3-1 win and ended a perfect tour. Hopefully we increased our profile in Brazil and pick up a little marketing revenue in the process. After getting of the plane from Brazil, I walked into the Chairman’s office and we discussed improving our youth situation. He agreed to increase the Junior Coaching Budget and the Youth Recruitment. So improvements to the club are continuing to be made. After the draft I needed to sort out my roster, and whittle it down to the final 28. First I’ll go position by position. At Goalkeeper, the stater will still be 2016 Allstate Goalkeeper of the Year Tyler Deric. Last year the backup was Joe Willis, but in 2017 it will be Hector Escobar. That means the #3 spot is between Calle Brown or Joe Willis. Willis is the odd man out because he is occupying a Senior Roster spot and is making $45K more per year than Brown. So I’m going to transfer list Willis, and if noone wants him by the time Registration comes around then he will be waived. I have seven guys at DC. Jalil Anibaba, who was recently called up by Bruce Arena for the January USA National Team camp, and loanee Riccardo Marchizza were the planned first two starters, with Leonardo and 22-year old Danil Rajden slated to be the backups. However, the signing of Designated Player Mathiey Debuchy from Arsenal has changed that. I will now look to move Leonardo, as he has reached his maximum potential and I prefer a different type of player at his position. Radjen has good potential and needs to start working into the rotation. Behind them I have Robby Sagel and Taylor Hunter. I do want to have at least five, but Hunter is no-hoper while Sagel could at least develop into good-not-great player. So Hunter will be waived, not loaned. At right back I just brought in DP Para, and his backup (for now) will be loanee Kyle Duncan. On the left I still have Beasley, although he has deteriorated quite a bit, with Olexander Osman (loanee from Dynamo Kiev) competing for that spot. Dylan Remick is also there, but he’s about maxed out on potential and he’s really not that good. What I’d like to do is trade or sell Beasley or Remick, but if that doesn’t work then Remick will likely be loaned out. Behind them I have two guys I just drafted in Alfonso Garcia who can play on either side or left back Joe Thorpe. They will probably both be loaned out. If I need one to stay for depth then it will be Garcia. At defensive mid I have plenty of options, really. The plan as of now is to start Cabezas with Eric Alexander backing him up. Lukman Haruna can also play there, although he is the first choice MCR option at the moment. Kyle Duncan can also play DM in a pinch. The MCR starter will be Haruna, and at MCL (the more attacking role) will be Tomas Martinez. Memo Rodriguez and Cristian Lucatero will be the two guys I hope to be the primary backups to begin their development. I need them to be strong players by the time the Knockout Stages of the CONCACAF Champions League rolls around next January. For now, Alex will be considered the backup MCL although I’d like to move him. Tommy Thompson can also play in these positions if needed. I hope to be able to send SuperDraft pick Miguel Angel Robles on loan to RGVFC. Joe Holland is a no-hoper and will be waived if I can’t sell or trade him. At winger, I plan on employing my Honduran connection: Alberth Elis on the right and Romell Quioto on the left. 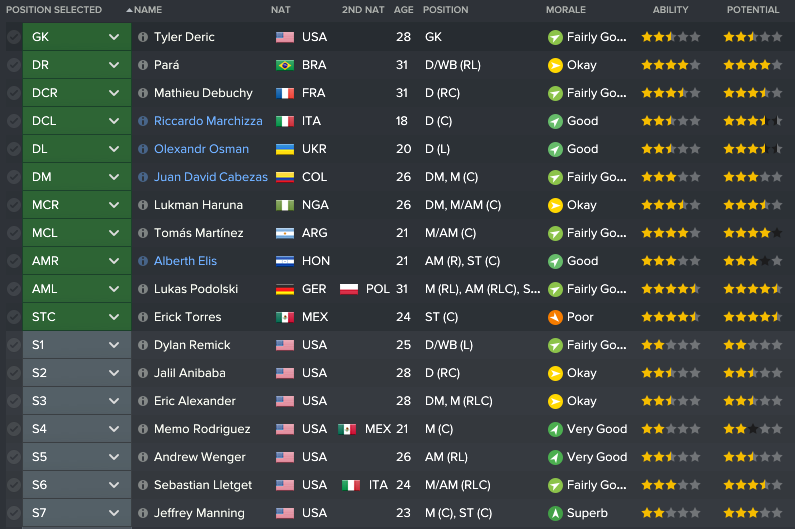 My original plan was for Andrew Wenger to be the main backup on the right and Jose Escalante on the left, with Wenger being able to play either side. However, with the guys I drafted I’m now going to look to move Wenger. He’s another guy who has mostly maxed out his potential and I believe that Erik Ramirez and Jeff Dyer can both be better. Vincente Sanchez has set a retirement date for the end of this season. He still has good skills but his physicals have deteriorated. He’s a sub now at best. Striker is definitely a position of strength for us. We have Erick Torres coming back, who netted 26 goals across all competitions last year, including 20 in MLS play. Mauro Manotas is his backup and we have high hopes for him. We drafted Jeff Manning and we believe he is a future goal scorer in the league, and Adonijah Reid is a 17 year old Canadian that we picked up off waivers last season. We’d like to have 3 on the squad and Reid’s international status makes him the most likely to be loaned out, especially considering that he wouldn’t even be in the top 2. His contract also runs through 2019, so there isn’t necessarily any urgency to get him on the field. After looking at the squad, I did find that I would have one too many International Players. It was a difficult decision, but the odd man out was Romell Quioto. He’s a good player, but he was not going to get much better and he played a position where I had plenty of comparable options. The best offer I found was for a second round pick from the New York Red Bulls (via the Philadelphia Union). NYRB was the only interested team and he will be less likely to hurt us in the Eastern Conference, so that’s where he went. So the guys who will be waived if they aren’t sold: Joe Willis (GK), Taylor Hunter (DLC), and Joe Holland (DM, MC). The players who I’d like to trade, but might loan out if I can’t are: Alex (MC/AML) and Andrew Wenger (AM RL). And the guys almost certainly going out on loan: Alfonso Garcia (D RL), Joe Thorpe (DL), Jeffrey Manning (ST, MC), Miguel Angel Robles, (MC, AMC) Erik Ramirez (AMR), Jeff Dyer (AML, ST), and Adonijah Reid (ST). There is also the question of what to do with DaMarcus Beasley or Dylan Remick. One or the other probably needs to go. But that will get me down to 28 at least. Next I’ll be back with the final results of the Preseason and a look at the roster heading into the 2017 season. Loving this thread! Always want to do an MLS save but they always seem too complicated! Well, I'm not going to lie to you, it is complicated. Especially for someone who hasn't grown up around the rules. However I do have a guide that should help with those who are unfamiliar with the MLS squad rules and competition format. Here. 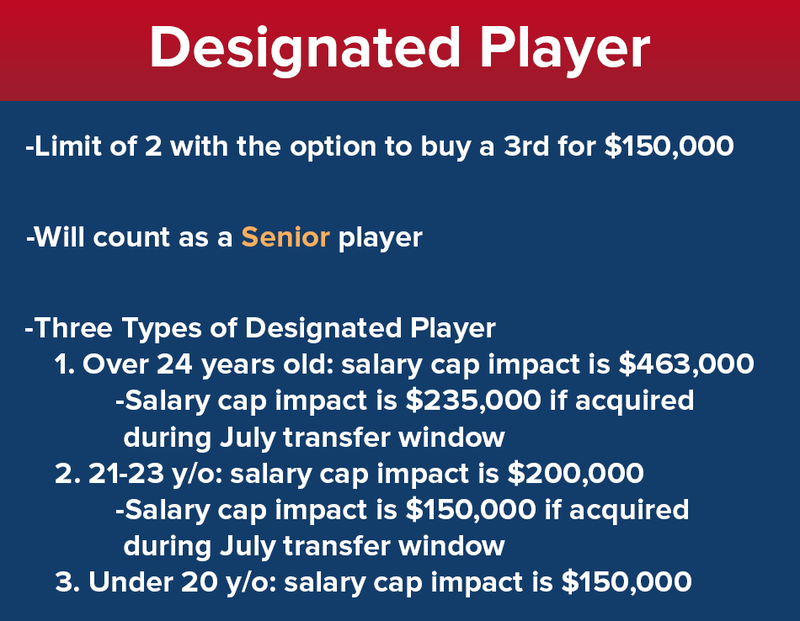 So there are several ways to acquire a Designated Player, but you will frequently have agents approach you with possibly signing their client to a DP contract. 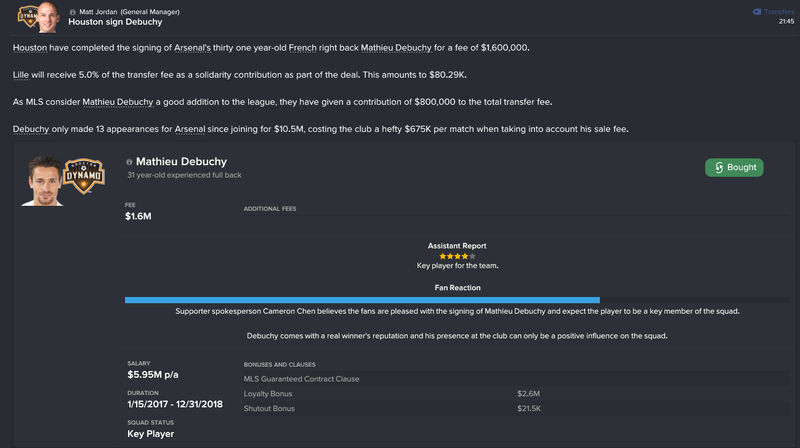 I mostly ignore those, but when the agent for Arsenal's Mathiey Debuchy came to me, I decided that I needed a quality center back who is comfortable with the ball at his feet. After scouting him, I went to make an offer for the player. Now, when you're approaching for a DP there is often an option for "INTERACT WITH BOARD", where you can ask the board to approach MLS about helping to pay the transfer fee. I did this and it the board agreed and the league agreed so we were able to agree on a contract. All I had to do was hit the confirm button at the bottom (not pictured) and voila, I (essentially) had 4 Designated Players. As you can see, MLS took care of half of the transfer fee. I'm still paying him quite a bit, but if he helps us win MLS and the Champions League then I'd say it was worth it. Unfortunately I didn't end up with Mcguire. I picked the goalkeeper Escobar instead. Escobar already is an eyelash behind my starter Deric. McGuire landed with the Rapids. So far he's only played about 12 minutes of a friendly but I'll keep my eye on him. I'm also going to be watching Carranza from pretty close, as he plays for the 2nd place Supporters Shield finisher last year, Sporting Kansas City. 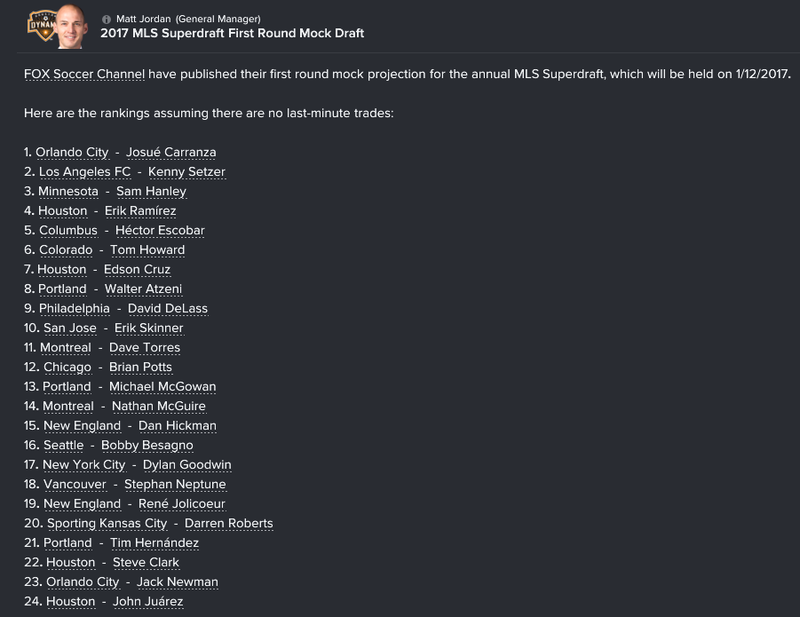 The #1 pick Kenny Setzer is also already starting with FC Dallas, my arch rival. Those are going to be some interesting matches come this season. Paying close attention to the SuperDraft kind of adds to the drama of MLS in my experience. If Carranza falls to me at the fourth pick then I’ll probably take him. He looks pretty good, but more like a full-on winger. I prefer more of an inside forward, someone who is a better passer and finisher than crosser. I could definitely get behind this pick. A pacey striker with good finishing. Obviously he has some rough edges to work out, but he would not be a bad pick. If I picked for every team in the draft, this is how it would go. This helps me to do a couple of things: First of all, I will make my pick based on this list. For example, in the 2017 my first pick is 7th. If for whatever reason, Sam Henley is available at #7, then I am selecting him. I also have noted on this list who the Generation Adidas players are. This will help me get an idea of how each player will affect the salary cap. The other good thing about this list is that if ANY of these guys are still on the board when my second round pick comes up, I will choose them. That is unlikely since I have the last (24th) pick in the second round, the list is still helpful. I won’t bore you with the lists but I make one for each of the first three rounds, and it’s almost always good enough for the fourth round as well. I very rarely have to make a fourth round pick of a player that isn’t on my board for the first 3 rounds. There are different ways to assemble your draft board. My personal philosophy is simply to take the best player available. This could mean best current ability, highest potential, or a combination of the two, but ability is the only factor I take into account when building my board. Another philosophy is to build your draft board according to your needs. I don’t want to pass on what might be a world class striker simply because I need a fullback. I’ll worry about those issues after the draft. So, very exciting, here we go. The draft starts with FC Dallas making a somewhat surprising pick of Kenny Setzer at #1. Not shocking, as he was #2 on my board and on the Mock Draft, but there you go. Sporting Kansas City then acquires LAFC’s #2 pick during the draft and picks the highly touted Carranza. No big shocker, Minnesota United goes with Sam Hanley at #3, just as I expected. So that brings up my pick. I went to my Inbox first, just to make sure that on other clubs were offering me something for this pick. It was actually a harder choice than I thought, because next on my board is a goalkeeper. I normally don’t like using first round picks on goalkeepers because there are usually plenty. So looking down my board I have Ramirez, who as I already stated is not a great fit for my style of play. Next on my board is a striker named Nathan McGuire from the University of Rutgers. The kid looks pretty good. His physicals are eye-popping, he obviously has great determination, and his finishing looks to be high. This guy is starting immediately no matter who takes him. Ramirez not fitting my style and also not being a Generation Adidas mean’s I’m not taking him. It was a tough call between Escobar and McGuire, so I asked my Assistant and he suggests Escobar. There is strength in numbers when it comes to player evaluation, so I choose Escobar. He will allow me to get rid of one (or both) of my backup keepers, sit for one year behind Deric before becoming the first choice guy in 2018. The first big surprise comes with the 5th pick when Columbus took Dave Torres (DM, MC). Torres was a guy with good current attributes but I rated as a second round pick at best because of his lower potential rating. So I cross my fingers hoping that McGuire would still be available at the 7th pick. Sadly, the Colorado Rapids nabbed him at #6. So with #7, I either have my the 7th guy on board, David DeLass, or Ramirez. Wanting to be thorough, I look at Tom Howard, another AM R prospect who I rated 8th. Comparing Howard to Ramirez was basically a wash. First of all, it’s not clear because I don’t have complete scouting on all of their attributes. Howard definitely has superior technique, finishing, decision making, and natural fitness. But Ramirez has better vision and is a slightly superior physically gifted player. One disadvantage for Ramirez is that he is not a Generation Adidas and will almost certainly demand a Senior Contract, which will affect the salary cap. In the end, however, I have to go with Ramirez. While not the perfect fit for the system, I have to believe that I can develop him into what I need. 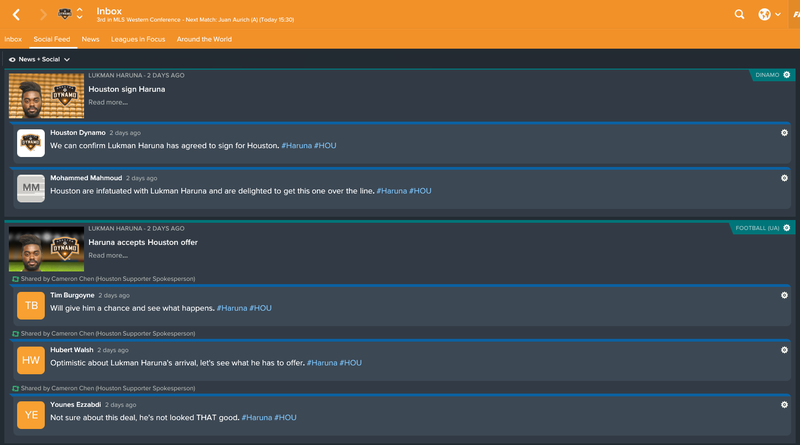 I won’t worry about the salary cap impact right now because I’m most likely going to loan him to Rio Grande Valley FC the first year anyway, and I have to take the best player available. Of course, Tom Howard was taken with the very next pick by Conference-rival Portland Timbers. This kid had some of the best physicals that I saw in the draft. Scouts rated his potential to be pretty high as well. After drafting Ramirez and Dyer I was curios to see how Wisconsin performed with these two lads up front. In 2016, they went 15-3-5 (5-2-1 Big Ten), won both the Big Ten regular season and tournament championships. They made it to the Elite Eight (quarterfinals) of the NCAA Championship Tournament before falling to Presbyterian on a golden goal. I think it would be kind of cool if someday they could be on the front line in the future, winning the MLS Cup. Scouts are high on him, he’s a local guy, and I like his determination. I believe he’ll develop into a top MLS striker. 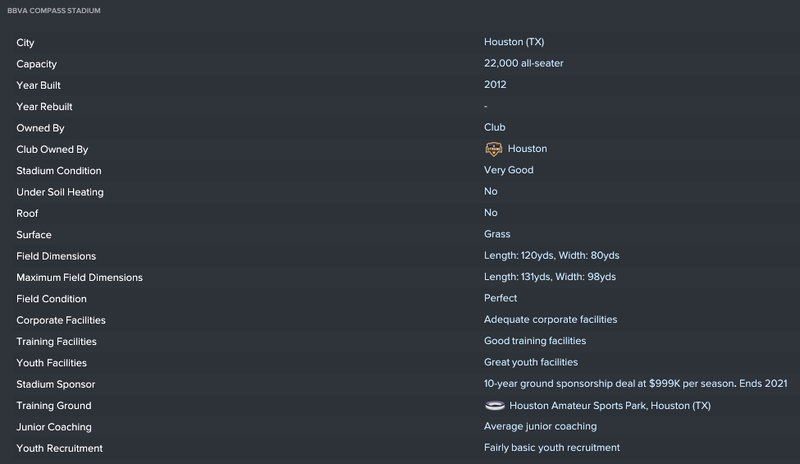 His first year I will ship him off on loan to RGVFC, which is where he played college so he's familiar with the area. At this point I’m absolutely drafting based entirely on potential, which my scours are high on this guy. He’ll be a good team guy, possibly a future captain. Clearly as a player he is a bit of a project to become the attacking fullback that we prefer, but he’ll get there. Another guy to help at outside back in the future. Versatile enough to play on either side, which was certainly a factor on choosing him. This is where the challenge really begins for putting together your MLS Squad because as of now I have 38 players. This means that at least ten of those guys have to either be let go or sent out on loan. While obviously a handful of no-hopers can be sent packing, the rest will be tricky as I have to take into account the salary cap, international player restrictions, etc. I’ll look at that, as well as my preseason, in the next post. Haruna’s acquisition was the named the club’s best signing, although really it was our ONLY signing. Haruna was a very important player for us and was definitely worth the salary we paid him. I have three affiliates that function essentially like Reserve and Youth teams. Here is how their 2016 season went. RGVFC Finished 3rd in the USL Western Conference with a 16-7-7 record. They were actually second in goals scored. Their performance was good enough for the USL Playoffs, but they were eliminated in the Conference Quarterfinals by Tulsa Roughnecks. The Cavalry are a U23 team that competes in the Premier Development League Mid South Division. The club plays a 14-match schedule in the summer, but they did not have the kind of season they would like. They finished 3-3-8, 5th place in a division of 6 teams. This is our youth affiliate. They had a really good season in 2016, winning the USSDA Frontier Division with a 17-6-7 record. Their 65 goals scored was the second highest in all the USSDA. They were eliminated in the group stage of the USSDA Championship, finishing 2nd to the team that would go on to win the competition. Looking at my squad, there are a few areas where changes need to be made. I make some mental notes as I head into the offseason. Strengths: Striker, Central Midfield. I’ll begin by understanding where I don’t have needs. At Striker, I have Erick Torres who scored 26 goals in all competitions last season. Mauro Manotas, while not productive in his limited appearances last year, has a lot of potential. My scouts are also high on Adonijah Reid that we picked up off waivers last year. There is absolutely no need to bring anyone in at striker. We have a plethora of central midfielders. Tomas Martinez, Lukman Haruna, and Juan David Cabezas make up one of the best triumvirates in the league. Memo Rodriguez can occupy one of the positions behind the forwards, and at 20 years old he can only get better. Alex and Eric Alexander provide more depth, although they aren’t long term options there. I would prefer to go younger with the backups but there are other priorities. Weaknesses: The back line. Pretty much every position. 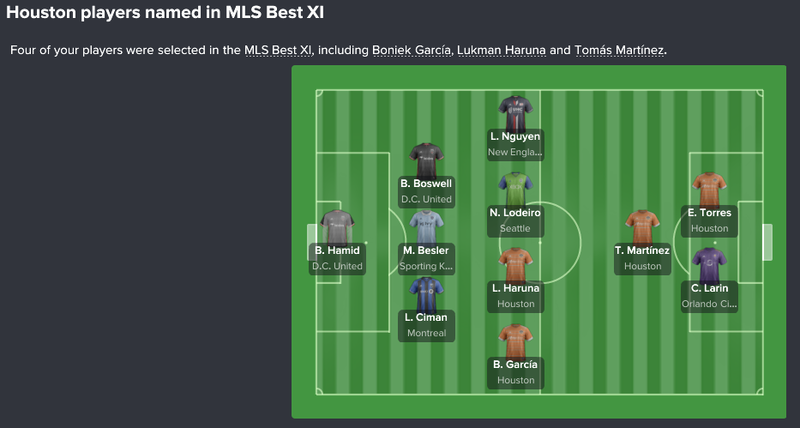 Last year I played Boniek Garcia as the first choice right back, but he’s more of a midfielder. Behind him it was kind of a patchwork situation. I played A.J. DeLaGarza, Adolpho Machado, and Jalil Anibaba there. At left back, DaMarcus Beasley is 34 years old. He isn’t going to be a high level player for very much longer. Behind him is Dylan Remick, who never was starting-MLS quality. Center Back is another position where I played a bunch of different guys. Ricardo Clark played at center back for most of the year, but he can slot into the midfield if needed. Leonardo was a first choice DC, but I would prefer someone with stronger ball skills. The same is true of Agus. DeLaGarza and Machado fit that description, but lacked in important defensive technical or physical attributes. I have a couple of young center backs that I hope I can develop into the type of player that I want, but they’re not ready to start yet. I’m actually solid at Winger, but I’d like to strengthen depth. Hondurans Alberth Elis (20), Jose Escalante (21), and Romell Quioto (25) are young and dynamic. Andrew Wenger can play on either wing and makes for a strong backup. Vincente Sanchez is 37 years old. My goalkeepers aren’t terrible, but I would also like to improve there as well. Deric won the goalkeeper of the year but it had more to do with our limiting opponents’ chances with our possession style of play. Joe Willis is not a significant drop off from Deric, but neither have the potential to improve very much. I do have a goalkeeper that my scouts are high upon so I will consider signing him, but he is due one more year of development at that level. Atlanta United approached me for Boniek Garcia. Obviously Boniek is a valuable player, but he is aging and they put a first round draft pick on the table. It was hard for me to imagine getting better compensation so I accepted. Atlanta had the 4th pick in the draft, so it will probably mean I’ll get a very good player. 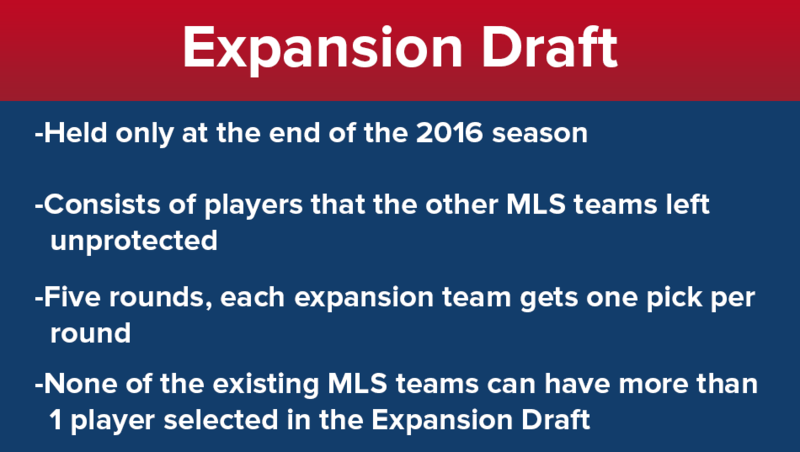 Next came the Expansion Draft. This is where the four expansion teams get to choose players that the existing MLS clubs choose not to protect. The clubs are required to protect 11 players, which must include their homegrown players and any players they have brought in loan. I chose to protect Erick Torres, Mauro Manotas, Tomas Martinez, Ricardo Clark, DaMarcus Beasley, Lukman Haruna, Romell Quioto, Juan David Cabezas (loan), Alberth Elis (loan), Jose Escalante (loan), and Memo Rodriguez (Homegrown). With the first pick, Atlanta United chose A.J. DeLaGarza who I was not too disappointed to let go of. Fortunately, by rule I can only lose one player in the Expansion Draft. D.C. United came in offering their first round SuperDraft pick (22nd overall) for Ricardo Clark. They also wanted the rights to Luis Garrido, some General Allocation Money, and one of our international slots for one year. I don’t like letting go of my international slots for any amount of time, so I renegotiated by adding more General Allocation Money. 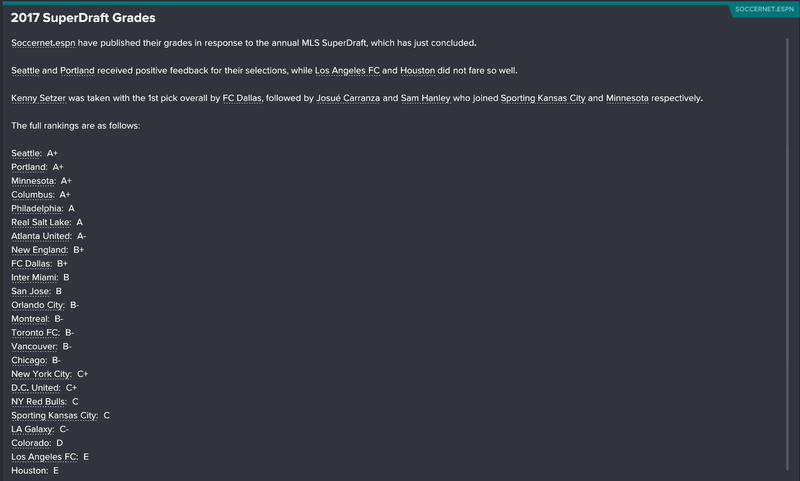 They accepted this offer and while losing Clark hurts from a veteran leadership perspective, I know have four picks in the first round of the SuperDraft (4th, 7th, 22nd, 24th). This will be consistent with my transfer philosophy as the players I will be receiving should all be in their early 20’s. I shipped 31-year old Adolpho Machado off to Montreal for… nothing. I also wanted to move Agus so I offered to him no Non-MLS clubs. The only club to come back with an offer was Troyes, offering $240K. I accepted without negotiation. It was below his value of $1.2M but he’s 31 and noone was going to offer me that. Leonardo is a player that I want to move because he doesn’t fit the style of play and now he’s coming asking for a bigger contract, but losing DeLaGarza, Clark, Machado, and now Agus has left me thin at center back. I might still try and move him after the SuperDraft and after I try and strengthen the position through Discovery signings but right now I need to keep him just in case I can’t improve my DC situation. The supporters were not happy with this loan, and to be fair his skills are not first team-quality yet. However, I see him mainly as a second teamer at right back and occasionally at DM with high potential. I do have an option to purchase for $500K so we’ll see how that goes. He will walk into the starting XI and only get better. His passing isn’t where I’d like it to be, but we’re going to hit that hard and hope he improves. So about a week before the season turnover date (Dec 26), you will get news items informing you that the players have been selected for the MLS SuperDraft and the Generation Adidas players are announced. The SuperDraft players are obviously the pool of players that you will choose from when it rolls around in January. The Generation Adidas players, as mentioned in my guide, are a group of 12 players in the Draft pool who have been given special contracts that will not count against your Salary Cap until they graduate from the GA program (3 years-ish). This method gets me scouting reports on 68 of the 150 players at the SuperDraft. The club announced a profit of $10.25M for 2016. This probably pales in comparison to some of the profits for the big Euro leagues, but for MLS that’s a pretty big number. Turning profits will help to secure the improvements I intend to make at the club. Speaking of facility improvements, the board approached me about possibly increasing the budget for Physios, or investing the money somewhere else. I suggested improving the training facilities as I see that as our greatest immediate need. They obliged and we are now in preparation to make those improvements. The club also acquired a new 4-year, $800K sponsorship deal which is obviously good for $200K a year. Not a monster number, but every bit helps. Obviously there will be 4 new clubs entering the league next season, Atlanta United, Inter Miami, Los Angeles FC, and Minnesota United. The league has also increased the salary cap to $3.84M p/a, so that will help. Our club was also given $800K worth of Targeted Allocation Money, which we can use to convert a Designated Player to a Senior Player, allowing us to sign more than the maximum 3 Designated Players. I always like going on tour to start my preseason. This year I’m off to Brazil. In these first four matches I like to play my first 11 for one half, then the second 11 one half. I rotate which 11 starts the match. When I get back from the tour, I have some matches against cupcakes setup where I force the players to play the whole 90, rotating between first and second squads. I also like holding a little cup with the smaller local clubs as a final prep for our preseason exhibition competition, which this year is the Desert Diamond Cup. And I always end the preseason against my U23 and my Reserve affiliates. 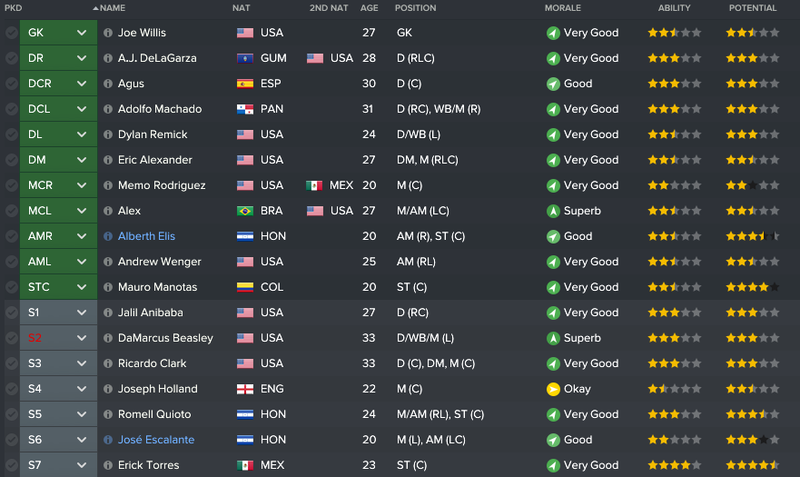 Next I’ll do a post on the SuperDraft, and how I go about maximizing my team using it. I don't really have any plans, per se. I usually let these games progress and take me where they go. I actually got sacked in one game I played earlier when I finished 3rd in a rebuilding season. In that save I took the USA U23s to the Olympics and finished silver. The Atlanta job actually just opened as Martino left for Southampton without ever coaching a game for ATL. The fun that goes into an expansion team would most be gone, as the team is already built. I do enjoy journeyman saves, going around and trying to win the different club continental competitions. The Whitecaps came in tired after outlasting Seattle in the Wildcard round to advance. We took advantage, shelling in the away leg 4-0. The home leg was a little more even, but we were still victorious winning 2-1 and moving on the conference final. This is where our finishing problems really started rearing its head again. 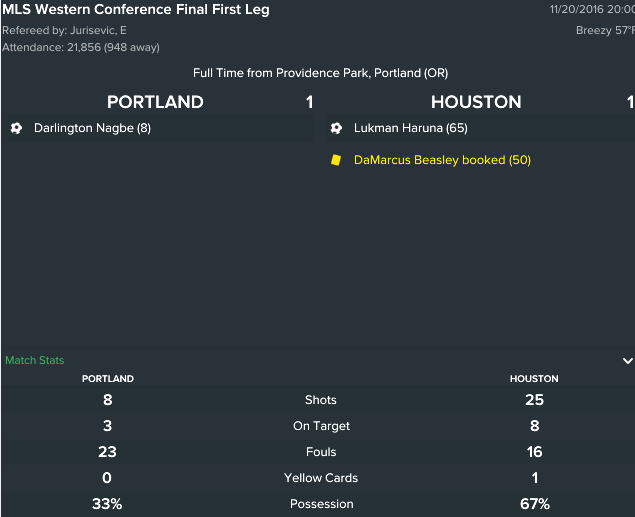 At Portland in the first leg, we dominated possession and created 25 shots, but were only able to escape Providence Park with a 1-1 draw. In the home leg we were even more dominant and yet we only scored two goals on 27 shots, and one of those was a penalty. Nevertheless, it was enough for a 2-1 win and the Conference championship. We caught a bit of a break when Orlando City SC made their way through the Eastern Conference. Orlando finished 4th place in the Eastern Conference, and had to defeat the top two teams New England (1) and DC United (2) to reach the MLS Cup. Overall, Orlando City had the 8th best record in the league. So obviously we could have faced stiffer competition. 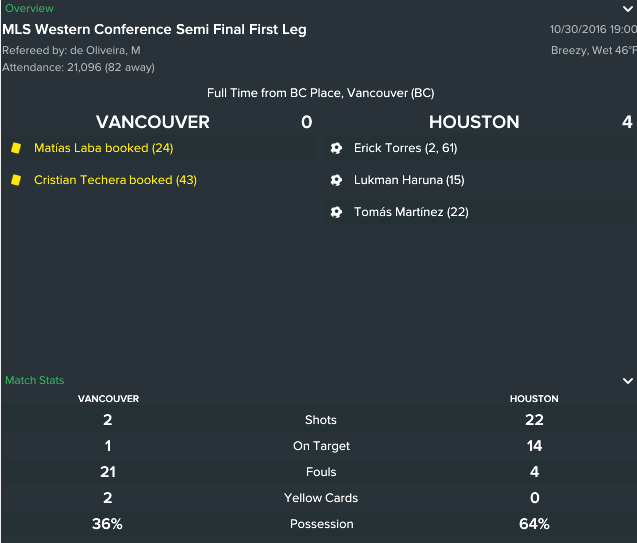 The week of the Cup Final Tomas Martinez suffered a twisted ankle that would have put him out 2-3 weeks. 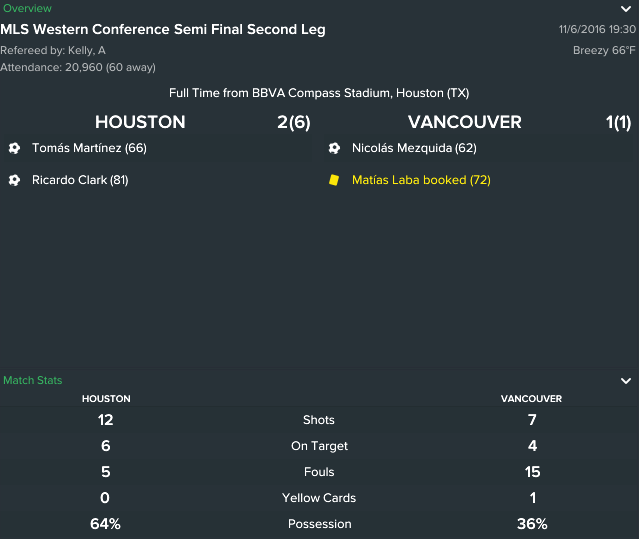 I NEVER do this, but seeing as how this was the final game of the season I decided to give him the injection to get him through the Final, and it would actually turn out to be a brilliant move. Tomas was credited for an assist when Boniek Garcia knocked in his free kick after it rebounded off the crossbar. Martinez would then knock in the match’s final goal to bring the MLS Cup back to Houston for the first time since 2007. Great first season, but this offseason we have some decisions to make with six players over 30 and one more turning 30 next year. The results really dipped in about the middle of the season where we lost four matches out of six. We obviously recovered in mid-August, losing only once in our last 13. If there is a concern heading into the playoffs it would be our lack of finishing towards the end. In every match we were creating chances, we just weren’t putting them away. Some of that could be attributed to injuries to some of our top players and the fact that we played our second 11 in a few of those matches, but even with most of our top players on the field we struggled to put the ball in the net. Not sure that there is anything for me to do as we created the chances, it’s just a matter of the guys putting them away. Leonardo’s passing percentage. I don’t like any regular starter to be below 80%. Given his attributes, this really isn’t surprising. That’s one change we will look to make in the offseason. Vincente Sanchez’s pass percentage is also a bit low for an attacking player at 84%. While not terrible, in contrast his counterparts Quioto (88%), Escalante (88%), Wenger (90%), and Elis (90%) all had significant better percentage. I’m going to overlook the passing percentage because the reality he is that he is very old and will likely be let go, and he was the team leader in assists. I’m actually quite happy with the team number of mistakes. Cabezas has 32 which was the most, but none led to goals and most of the rest of the teams in the league had players in the 50s and 60s in mistakes. 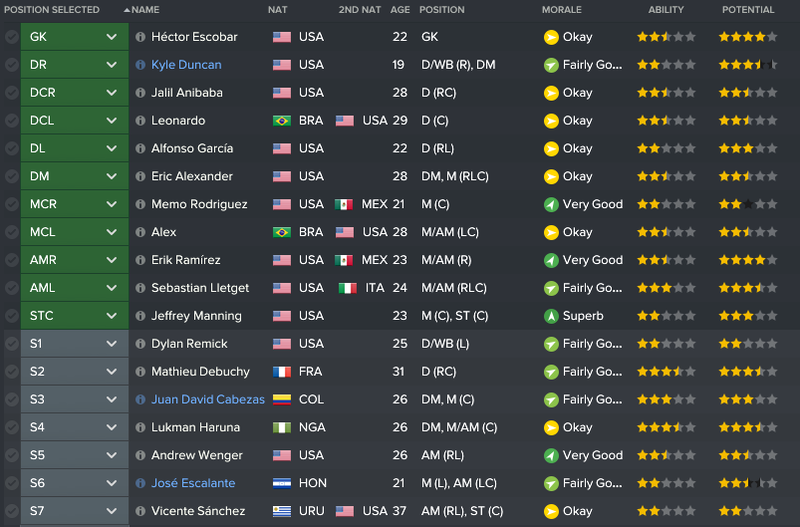 The squad rotation policy that I covered in a recent post turned out to be a success, as nervous as the game against Philadelphia turned out to be, however International call-ups played into that. Surprise package North Carolina FC (from 2nd division NASL) did make things interesting by staying within a goal until deep into the match, but our policy of keeping guys fresh for Cup matches clearly paid off. 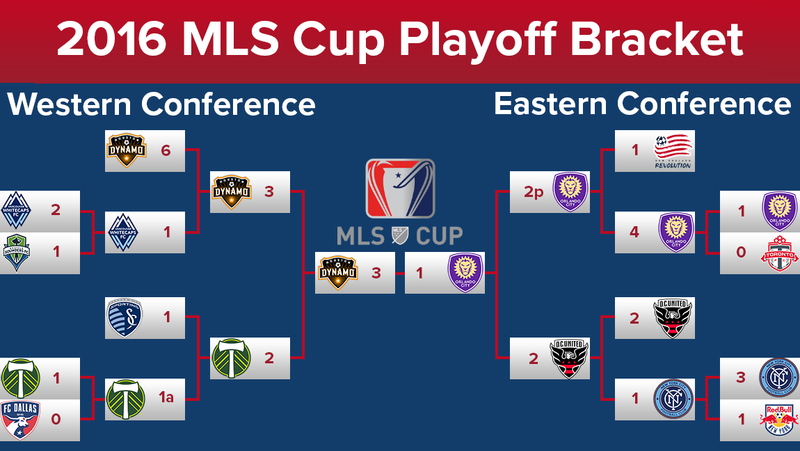 As I stated in MLS guide the playoffs begin with a “Wild Card Round”. 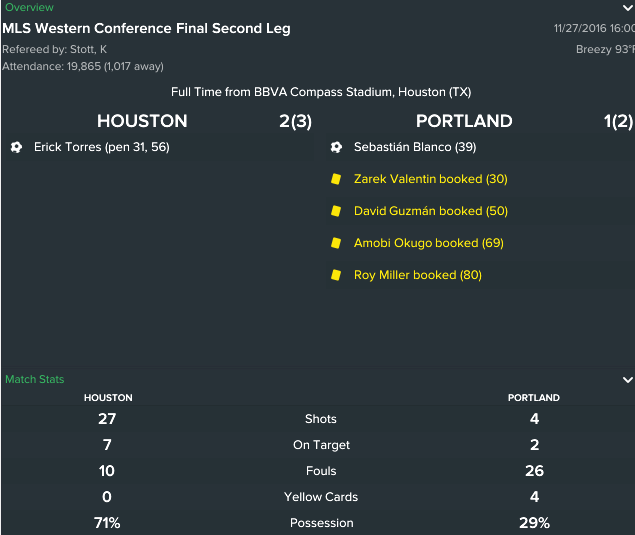 Our performance allowed us to bypass this round straight to the Western Conference Semi Final. Our opponent will be the Vancouver Whitecaps, who advanced from the Wildcard Round by defeating Seattle 2-1. The biggest advantage of earning a bye to the Semi Final is that your opponent will be forced to play against you after a only a couple of days rest. I’ve said before that I like to rotate my squad. I want every player that starts a match to be at least 95% fitness. I also just like to rotate to give players matches. I usually have four “Quick Pick” selections saved. If you don’t know, you use the drop down menu beside “Quick Pick” and then save selection so you can bring up the 18-man you want. This is also helpful if you use different tactics and have lineups in mind for those situations. This is obviously the ideal, best XI. This will be the opening day starting lineup (barring injury), and these are the guys I want in the team for the biggest matches. This my second XI according to the depth chart. If the first team played on the weekend and there is a midweek match (or vice versa), then I go with this quick selection. It keeps the first team fresh while also giving matches to the backups. I take the Open Cup seriously, and try to win it every year. However, there is a rule that there can be no more than 5 International (foreign) players in the Match Squad. This season, it only affects the substitutes as there are only 5 internationals in the First Team starting XI. However, some years it complicates things. When an Open Cup match is approaching, I also make sure to rest my Open Cup 11 in the match immediately before if it’s only 2-3 days prior. I also like to save a selection that features my youngest players. I don’t use this one very often, but it can be good for development to trot out at the end of a season where I’m well out in front of the rest of the league and the results aren’t critical. Squad rotation offers all of the benefits I already mentioned, and it also can help to reveal deficiencies in the squad that you might not have noticed otherwise. My scout rate him at 4 stars, so I felt he was worth a pick. 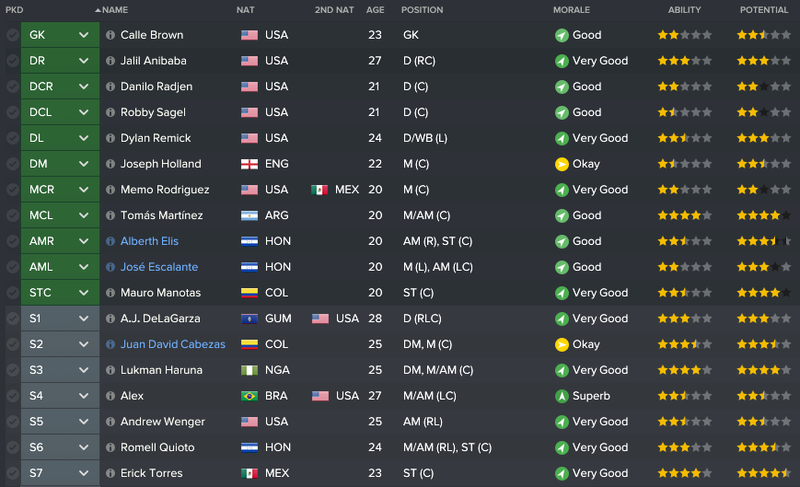 I love getting young strikers for free because the good ones are expensive and they bring a lot of money. Reid is 16, so I got him to an accept a loan to the Academy for this season. He needs at least a couple of years developing before he’s ready for the first team but I have high hopes. The other guys is a versatile M/F named Tommy Thompson. Not as big a prospect as Reid, but 3 stars is enough for me to take a chance and see how he turns out. At 20 years old he’s still pretty young. He’s got some flair, so if we can get his skills and determination up he could be an exciting player. The bookies have us picked to finish seventh overall in the league, which would have us end up in fifth in the Western Conference. We had no players selected for the Media Dream Team. We do have two players on the Key Players list, Erick Torres and new arrival Lukman Haruna. Our only blemish in the preseason was 0-1 loss at Columbian premier league Junior in a match that we thoroughly controlled. 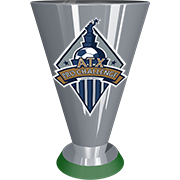 The shining accomplishment was winning the ATX Challenge Cup. We coasted through a 1-0 result against the hosts Austin Aztex, and then Erick Torres netted a brace in the final to defeat D.C. United. The preseason was a success in that our players are fit, happy, and tactically ready to begin the 2016 season. We even brought home a trophy and now it’s time to begin the MLS schedule. With a DP slot open, I decided to go bring in either a center back to strengthen the back line or a midfielder that could help me diversify my options. Unfortunately I have no Discovery Signings available until next season which meant I was going to have to rely on my scouts to bring me a Free Transfer. My first effort, Ze Roberto (DC), chose Real Sociedad over my offer. That hurt, because he was the ideal center back in our system. My second option was a player I’ve actually signed in past games so when I saw his name I knew he was my guy. Lukman Haruna is a versatile central midfielder who can realistically play in any of the 3 positions. He’s one of those, “Jack-of-all Trades but Master-of-None” type players. He doesn’t stand out at anything, but he does most things relatively well. He wanted over $600K p/a but my board wasn’t having it. Fortunately I was able to lure him a larger goal bonus (and I greased the Agents palms a little bit). I signed him for 4 seasons, but with any luck I will be able to sell him on for a nice profit before he’s played 2. My hope is that he helps us control the midfield. He definitely adds depth to the midfield and allows to drop Ricardo Clark from DM to DC if we need to. We also now have the pieces to occasionally roll out our 4-1-3-2 DM Narrow tactic. Our season begins with a Training Camp in Phoenix, Arizona during which we will make four trips for friendly matches. Here’s the team I’m taking with me. Tyler Deric is the clear starter. Joe Willis can step in in a pinch, but this is a position that needs an upgrade. I always know that going into a save with the Dynamo. We have a back four in mind heading into Training Camp: DR – Boniek Garcia, DC – Leonardo, DC – Adolpho Machado, DL – DaMarcus Beasley. Behind those four we have some decent, versatile options. A.J. DeLaGarza can play all along the back line, although his 9 strength makes a bit weak for DC. Jalil Anibaba can play on the right or in the middle. Agus is a solid Center Back option, but his 7 in passing isn’t an ideal fit for our style of play. Ricardo Clark is listed as a defender here but will actually be our first choice DM. As we said, Clark will start at DM, with John David Cabezas and Tomas Martinez in front of him. I am retraining Eric Alexander to back up Ricardo Clark at DM. Alex will fill in for the attacking MC role. The more balanced MC backup will be a bit of a competition between Englishman Joe Holland and Homegrown Academy product Memo Rodriguez. The two wide forward positions is our most crowded, depth-wise. First choice starters (for now) will be Vincente Sanchez and Romell Quioto. Youngster Alberth Elis and former #1 SuperDraft pick Andrew Wenger will certainly get their playing time. Jose Escalante is another promising youngster that will push for appearances, and Boniek Garcia could even slide forward if he had to. It’s going to all be about Erick Torres. Clearly the team’s best player, our system will be all about creating chances for him to finish. His backup Mauro Manotas has a lot of promise and will need to have some playing time to allow him to develop. The quality up front might force us to employ our two-striker variation. Team training during the preseason is all about fitness. Until our preseason exhibition tournament in Austin, we will be on high intensity Fitness training and less tactical training. When we get the first two teams’ fitness up we’ll work on mastering our tactics. My philosophy on individual training is to develop the best overall players that we can. To accomplish this, I have a default training regiment for each position. These are general, of course. If I feel a player needs to improve in a specific area I will adjust his training accordingly. Sometimes I will assign a DRC or a DLC to Fullback training to ensure that I can play him inside or out. So with my Major League Soccer Guide out of the way, I begin my quest. Let’s start by looking at the Manager. Born in Knoxville (TN), he prefers a possession-with-a-purpose style. He wants his team to have the ball while always looking for attacking opportunities. Among his inspirations are, of course, Rinus Michels, Johan Cruyff, Josep Guardiola, and Marcelo Bielsa. He has also drawn from the Kleiban brothers, American coaches responsible for the 343 movement in US youth soccer. The formations he will prefer to employ will be a 4-3-3 (4-1-2-3 DM Wide) and a 4-4-2 Diamond (4-1-3-2 DM Wide). When the need arises to be more defensive, he will use a 4-5-1 (4-1-4-1 DM). When the need comes to attack he likes to switch to a 3-4-3 (4-1-2-3 WB DM Wide). He also has a definitive transfer policy, which is one of fiscal responsibility. The overriding principle he operates by is to always receive more for a player than it cost to acquire him. There are a few rules he abides by in the transfer market to help him stay true to that principle. The best time to buy players is in their early twenties – The obvious exception would be highly touted youngsters from the Academy since the cost is minimal and therefore the risk is low. Aside from that, it is often a risky move to pursue teenagers. Many times we see a youngster that our scout is high on so we open the wallet and give whatever it takes in the hopes of finding the next Leo Messi only for them to never develop. 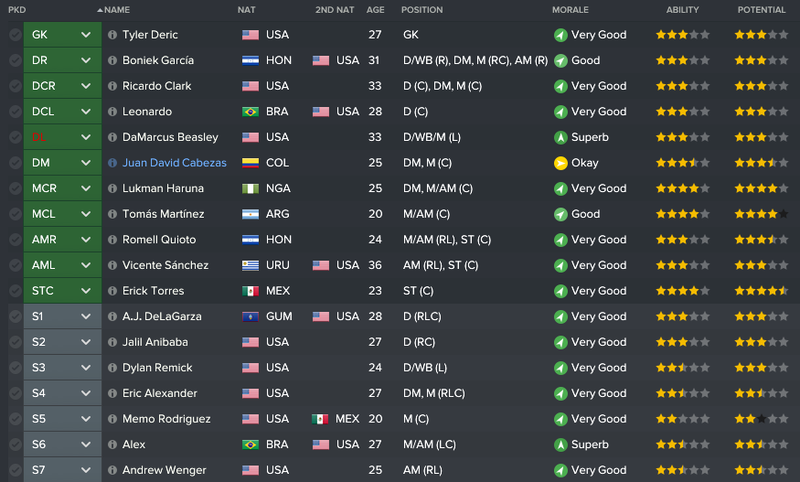 When a player reaches 21 or so, you can look at the attributes that your scout provides and see a player that even if he doesn’t develop into a world class star will at least contribute to the team. Players older than about 25-26 will be very difficult to sell on for more than you paid for them. Older players are overvalued – Pretty self explanatory. Many of these 28, 29, 30 year olds are expensive but their age means that their skills are going to deteriorate quickly. It is certainly tempting to go sign an aging star that you’ve seen dominate the game, but don’t break the bank to make it happen. Center Forwards are overvalued – These guys score the goals, get all the awards, get all the praise, and therefore inevitably demand a price well above their value. Their statistics inflate their reputation when the truth is that they are only able to score because the 10 men behind them provide them with the opportunities. In some matches they’ll end up with the fewest touches on the team and yet net a hat trick. So I definitely avoid paying a hefty sum to sign a center forward. I’d rather use that money to build up the squad behind a lower-reputation center forward who will score just as many goals. Then I can sell that CF for more than he’s really worth. Sell any player when another club offers more than he is worth – It’s very tempting to hang on to a player who is producing for your team. However, once a player turns about 23 or 24, I’m looking for the big offer. I might negotiate a bit to drive the price up as high as I can, but as long as the offer exceeds the players’ value I’m accepting. The reason is simple: a player’s career is unpredictable. Maybe he gets injured and never plays as well again. Perhaps he’s at the zenith of his performance, and it will only be downhill from there. Perhaps he gets upset that you rejected the bid and he starts playing poorly. Maybe it becomes impossible to resign the player to a contract and you get nothing for him when he leaves on a Free Transfer. (As a side note, selling players to foreign clubs in MLS is especially valuable because you get significant General Allocation Money in return). Replace your best players even before you sell them – If you’re going to sell a player when someone offers more than their value, then you better have a quality replacement already lined up. Since I’m always buying players in their early twenties, I’ve always got guys ready to step in and replace the starters. I also rotate the squad routinely. 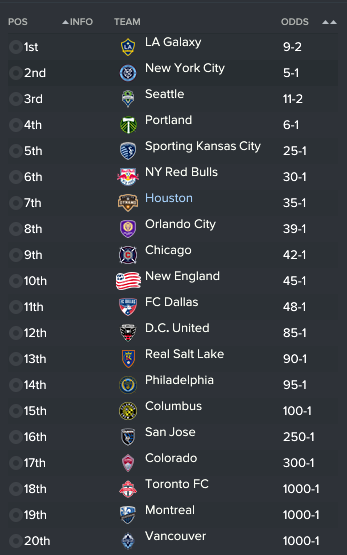 In an MLS season I’m playing all 28 guys at one point or another, and usually more than 22 will end up with at least 10 starting appearances. This helps me to see who’s ready and who isn’t, and it also expedites the development of the younger players on the team. I do have some other guidelines that I use that I wouldn’t call hard and fast rules. First of all I don’t go scouting international competitions for potential players. It’s generally true that performance in those is an unreliable indicator of quality. The opposition is varied and the statistical sample size is too small. I also don’t rule out players who seem to be behavioral problems as long as I have someone with a professional attitude who can tutor them off field. I especially like to use tutoring to help players’ Determination. The Houston Dynamo have competed in Major League Soccer since 2006. The team won MLS in both of their first two years in Houston after moving from San Jose. Among the club legends are Brian Ching, Dwayne de Rosario, Stuart Holden, Ricardo Clark (still with the team), Craig Waibel, Pat Onstad, and Wade Barrett. The club’s biggest rival is their Texas Derby adversary FC Dallas. The two teams MLS results are used to decide who wins El Capitan’s Cannon. The Dynamo also have a historic rivalry with the San Jose Earthquakes, who occupy the city and brand the Dynamo called their own before 2006 when they moved to Houston. A competitive rivalry has also developed with Mexican club Pachuca after some heated confrontations in continental competitions. 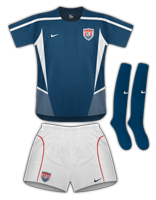 In 2007 the two clubs met in both the CONCACAF Champions League and the North American SuperLiga, with Pachuca needing extra time and penalties to advance, respectively. Houston defeated Pachuca in both the 2008 and 2010 SuperLiga, however the Dynamo lost both meetings in the 2009/10 CONCACAF Champions League. competitionsThe club has a short but proud history. 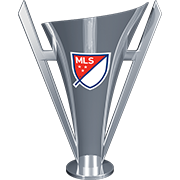 In their ten years of existence they have won the MLS cup twice finished runner up twice (only David Beckham’s LA Galaxy juggernaut could keep them from adding to their tally). 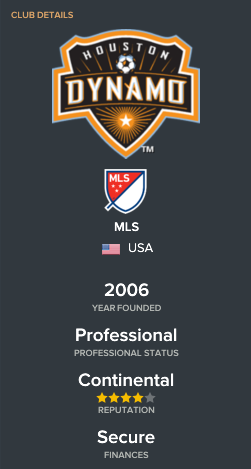 They also have the unique honor of winning both MLS Conferences twice. The Dynamo have advanced to the CONCACAF Championship Competition four times, but their best performance was the Semifinals in both the 2007 and 2008 CONCACAF Champions Cup. 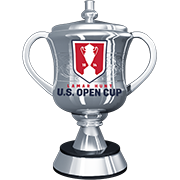 The club has also failed to win the Lamar Hunt U.S. Open Cup. The farthest that they’ve ever advanced is the Semi Finals in 2006 and 2009. BBVA Compass Stadium serves as the host grounds for the Dynamo. It has been their home since it was finished in 2012. The stadium seats 22,000 and can expand to 30,000. The Dynamo youth ground is the Houston Amateur Sports Park, a great facility for the Dynamo Academy. The Dynamo’s primary affiliate is Rio Grande Valley FC. The Toros play in the United Soccer League (3rd division). Houston can send players on loan and can also make players available for RGVFC matches. The Dynamo also have a U23 affiliate in the Premier Development League; the Brazos Valley Cavalry. The Dynamo Academy develops fresh talent for the parent club. This is where local, future stars begin their journey to professional soccer. You are welcome try. I always make all of add-ons open source. But you're going to have to go to each league and change the way it selects its teams. To make sure the game didn't reshuffle teams into different divisions, I set it up so that each league specifically gets the individual teams. Before I dive in to each method, let me explain the unique structure of the league. First of all, MLS is what is called a "Single Entity". Rather a league made up of 20-24 independent clubs, it is One Corporation with 20-24 sub-franchises. The league itself actually owns ALL of the player contracts. So when a foreign club wants to purchase a player, they negotiate a transfer fee with the league office, not the club that the player plays for. So when clubs within the league negotiate trades, they're really bargaining with the league's property rather than their own. This might help you to understand allocation money, which we'll cover towards the end. Probably the best way to think of the Trade process is to consider it domestic transfers between teams in MLS. This is simply the swapping of players and/or other assets. When two MLS clubs negotiate a trade, they have several assets that they can offer. General Allocation Money - Think of this as your domestic transfer budget. We will cover Allocation money more towards the end of this post. 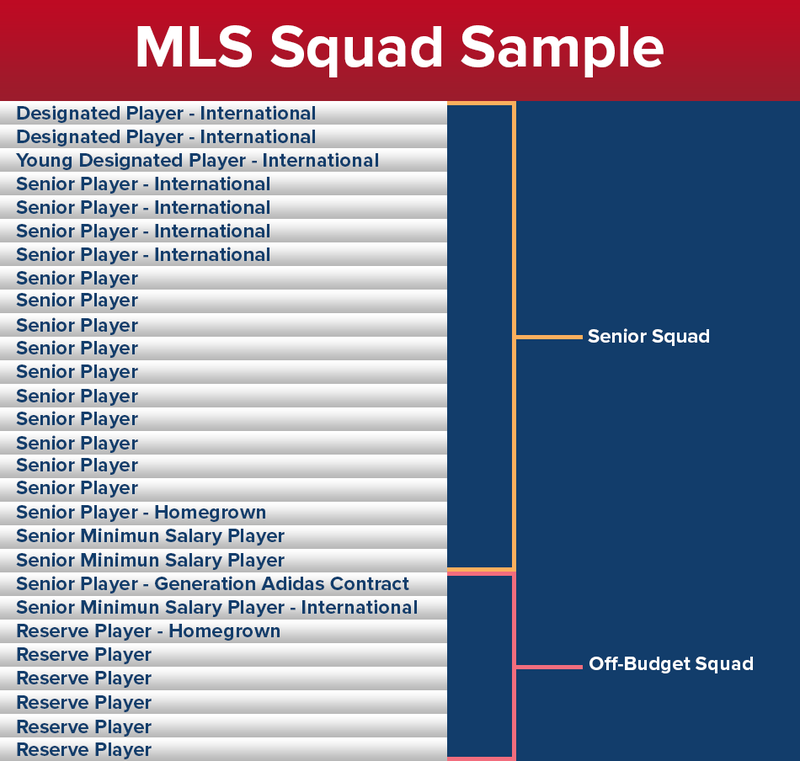 Current Players - Any player on your current MLS squad, besides those that you have loaned in from other clubs. SuperDraft Picks - One relatively valuable asset that clubs have are picks in the annual MLS SuperDraft that takes place every January. International Slots - MLS clubs can actually swap the number of foreign player slots that they have available. -Player Rights - When an MLS team loses a player to a foreign club before their contract is up, they retain the rights to that player should they return to the league. These rights are another asset that clubs use when negotiating a trade. 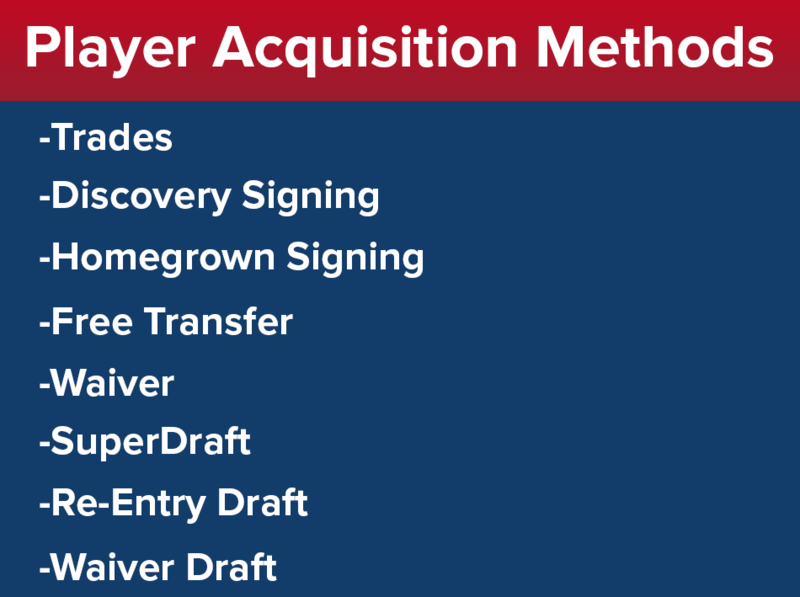 The Discovery Signing category essentially covers all player acquisitions from foreign clubs, whether it be transfers or loans. 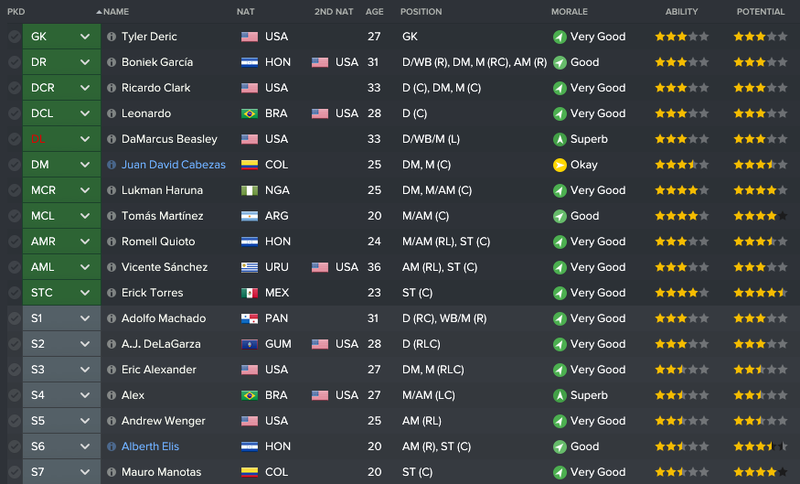 Transfer fees for Discovery Signings will come out of your club transfer budget, which is probably the most "normal" process in MLS on Football Manager. Your team will be allowed to make six discovery signings per season, although I have found that for most clubs all of the 2016 Discovery Signings have already been made so you might not be able to make any until the second season (2017). 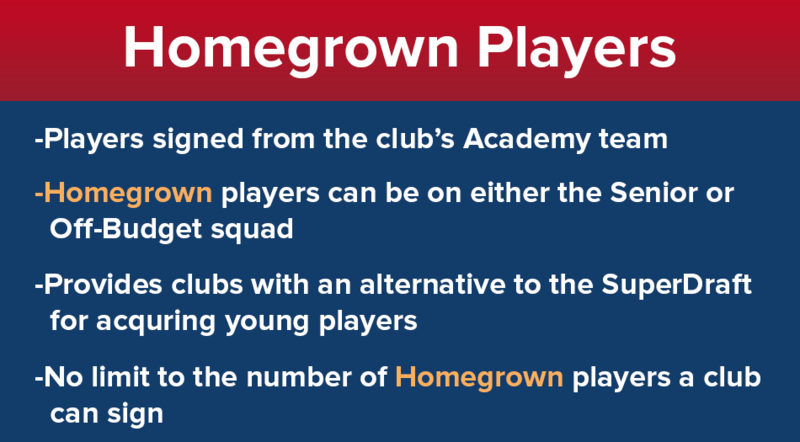 Homegrown signings are simply players that you sign from your Academy team. You can sign as many Homegrown players as you want, and they maintain their status until they leave your club. Free Transfers in MLS are not much different than in other leagues. The main exception is that if the player is based in a foreign country, they will count as one of your Discovery Signings. Also, if you attempt to sign a player whose rights are held by another MLS club, then you must negotiate a Trade to acquire those player rights. In the rest of the world, when a club wants to drop a player they have to "release them on a free transfer". When an MLS team wants to release a player, the process is referred to as "Waivers". It's a common practice in American sports where the team makes the player's contract available to other teams. When a team claims a player off of the Waiver Wire they are assuming the terms of the contract that the player had signed with the previous club. After a team has placed a player on Waivers, the other MLS teams have two days to make a claim. After the time is us up and all of the claims are in, the team that is highest on the Waiver Order gets the player. The Waiver Order is determined by how the teams performed the previous season, with the team that had the fewest points having the highest priority and the MLS Cup winner having the lowest. If no team claims the player before the two days are up, then player is released and is free to negotiate a new contract. In American sports the College Draft concept is one of the mechanisms used to try and maintain competitive balance. Rather than allowing players who graduate college, leave college early, or choose to skip college altogether sign for whichever team that they want, the league reverses the table from the previous season and allow the teams to select the player they want to sign in that order. The idea is that the worst teams get first choice of the best players entering the league out of college. The MLS draft consists of four rounds, which each team getting one selection in each round. As we have already stated, draft picks are a transferable asset that can be used in trades. In FM17, you can actually make trades for picks DURING the draft, which is a nice addition that mimics real life. The Draft itself takes place in the middle of January, right as the preseason is about to start. Certainly the draft is going to be more of a hit-or-miss prospect than scouting and signing an international player. Several players in the draft will never get much better than they are when you select them. However, there are some high potential players in the draft and it would be a mistake to dismiss it entirely. 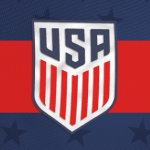 You will get a news alert informing you that players have been selected for the SuperDraft and the option to scout a few of them. There is also an MLS Draft Combine where about 70 of the 120 or so players are divided into four teams and they play a round robin competition. For good measure, I go to the squads of the four Combine teams and select all of the players and have my scouts assemble reports, so that I am as prepared as possible for the SuperDraft. At the end of the season, MLS gives players whose contracts are expiring the option to enter Re-Entry Draft. It functions much the same as the SuperDraft, with the Order basically being a reversal of the seasons table. Some players will reject the Re-Entry Draft and instead choose to leave MLS. There will occasionally be some talented players in the Re-Entry Draft that clubs were forced to let go due to financial or squad registration issues. After the squad registration, there are usually a lot of players that have been waived because teams chose not include them on their 28-man squad for whatever reason. The league's answer to all of these players suddenly being placed on the Waiver Wire was to hold a draft. The players who aren't selected in this draft are granted a free transfer. As with the other drafts, the Waiver Draft order is a reverse of the previous season's table. There are often some high quality players that teams simply couldn't fit on their squad. I will often leave a space or two open going into the draft by loaning players out to an affiliate. If it turns out that I don't like any of the players in the Waiver Draft, then I can simply recall those players off loan. And one bonus method of acquiring players: The Expansion Draft. MLS expands in 2017 to 22 clubs (or 24 in my database file). One of the mechanisms employed by the league to help expansion teams start with a competitive squad was to allow them to cherry-pick players from the existing MLS teams. The way that the process works is that the existing MLS teams are allowed to protect 11 players from their current squad. This list must include players that they have loaned in and Homegrown players. The 2 expansion teams (or 4 in my file) will then hold a draft where they are free to choose from all of the players in MLS that the teams have not protected. The draft consists of five rounds with each expansion team getting one pick per round. To prevent an MLS team from losing half of its squad, no existing MLS team can have more than one player taken in the expansion draft. So for example, if the LA Galaxy have a player taken with the first pick, then no more Galaxy players can be chosen in the draft. Obviously the expansion draft will only be open to the expansion teams. So if you play as Atlanta United or Minnesota United, then you will take part. Unfortunately, due to limitations with the editor, then that is even true with my database file as you will be unable to control LAFC or Inter Miami. What is this "Allocation Money" that you keep seeing in MLS games? The best way that I can think of to describe it is to imagine that you are playing a board game with friends that involves "play money", like Monopoly. The players all sit around the board and the banker distributes the money and the players use that money to play the game. In Monopoly, players can use the play money to go and buy properties, houses, and hotels on the board. They can't, however, take that play money and spend it anywhere else. That is essentially what allocation money is in MLS. The clubs can use the allocation money to perform functions within the league, but they can't go and buy players from foreign clubs with it because it might as well be Monopoly money to them. So how can you actually use allocation money? You must first know that there are two kinds of Allocation Money: General and Targeted. Both are very valuable in their own way. 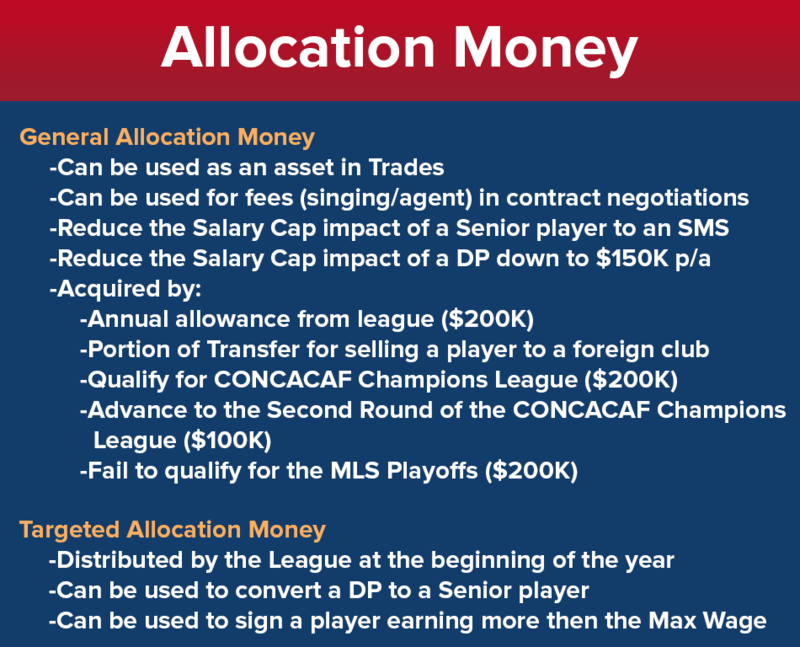 Both types of Allocation Money can be used in trade negotiations with other MLS clubs. They both also help you to manipulate your contract salary cap impacts, allowing to improve the overall quality of your squad. General Allocation Money can be used as Agent fees and Signing On bonuses in contract negotiations. Where it is really helpful, however, is that you can use General Allocation money to "buy down" the impact of a Senior Player's salary cap impact. So let's say you're going to be over the Salary Cap. 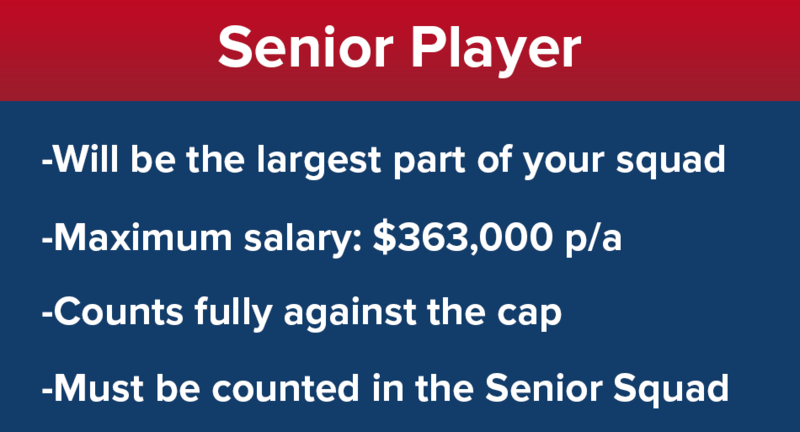 If you have enough General Allocation Money you can go to the "Contract Info" of one of your higher earning Senior Players, and there you will see the option to slide his salary cap impact down. How far you can go is determined by how much General Allocation money that you have. You can reduce a Designated Player's salary down to $150,000 with General Allocation Money. So how do you get General Allocation Money? First of all the league gives you a $200,000 allowance every season. There are also several ways to earn it. One way that you do not want to earn it is by missing the MLS playoffs. While you receive $200,000 of Allocation Money, you will also likely be sacked. 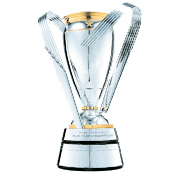 You also receive allocation money by achieving one of the methods for qualifying for the CONCACAF Champions League, whether it be winning the US Open Cup, winning the MLS Cup, winning the MLS Supporters Shield, or performance overall, you will get $200,000 of General Allocation Money. You can also earn another $100,000 in General Allocation Money by advancing out of the group stage of the CONCACAF Champions League. Probably the best way to earn General Allocation Money is by selling players to foreign clubs. While the league gets a significant portion of transfer fees, much of it is distributed back to the team though General Allocation Money. By developing and selling players for high fees, you can really increase your ability to sign quality players and maintain a strong squad. The only method for receiving Target Allocation Money is the allowance distributed by the league at the beginning of every season, starting with the second season (2017). Targeted Allocation serves two helpful functions. First of all, it can allow to convert a Designated Player to a Senior Contract player. If you have Three Designated Players, then this can essentially help you to go and get a fourth. It can also help you to sign a player who is demanding a contract that is above the Maximum Wage. It's also useless not to use the Targeted Allocation Money that the league gives you, because they take it all back at the end of the season. So that's how the player acquisition process works in MLS. Obviously it's a lot more complicated than the simple scout-and-buy process you see in most of the leagues around the world. I enjoy the challenge, and I actually think that it makes me a better squad builder when I do manage in other leagues. 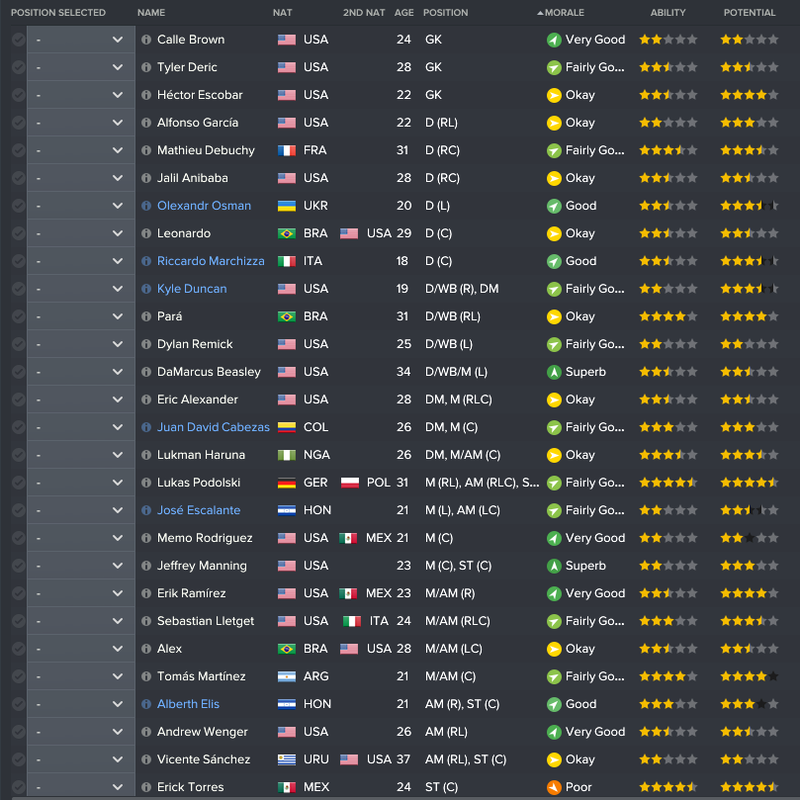 If you’re new to MLS on Football Manager, it can all seem ridiculous trying to figure out all the squad contract types. So let’s break it down. 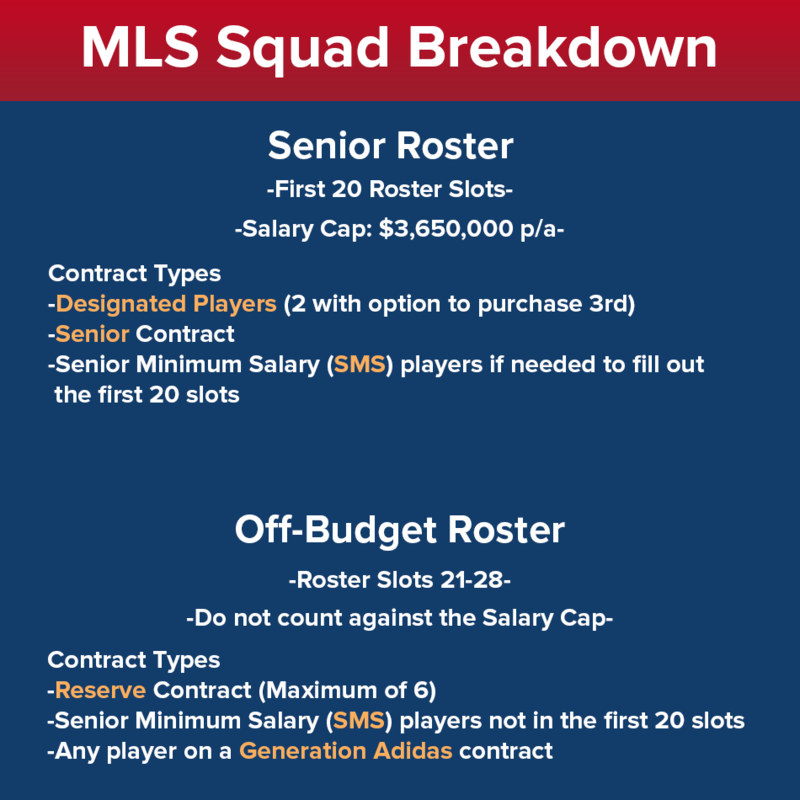 Essentially, the MLS squad can be broken down into two: The Senior Squad (First 20 Roster slots), and the Off-Budget Squad (slots 21-28). So let’s start with the Senior Roster. These slots count against the Salary Cap, which in the beginning of the game is $3,650,000 per year. That will go up slightly every season in-game. I believe the second year it’s $3,840,000, but that may not be accurate. Your Senior Squad will obviously have your Senior players. Your Designated Players (DP) will also be counted in your Senior Squad. If your DPs and Senior players don’t add up to a total of 20, then the remain slots will be filled with Senior Minimum Salary (SMS) contracted players. So, for example, let’s say that I have 3 DPs and 15 Senior players, that means that if I have 2 on SMS contracts, they will count against the cap also to round out the 20. I’m using this “First 20 slots” phrase to make it easier to understand, but the truth is that you can have more than 20 slots filled on your Senior Squad. For example, if I have 3 DPs and 19 Senior players, then all 22 of those players will count against the Salary Cap. It also means that I would only have 6 slots available for the Off-Budget squad. You can also actually not have all 20 slots filled. If I have 3 DPs, 15 Senior players, and no one on SMS contract, then I will only 18 on the Senior squad. It also means that the most I can have on my squad is a total of 26 as you can only have a maximum of 8 on your Off-Budget squad. The Off-Budget roster does not count against the Salary Cap. Your Off-Budget Squad can only have 8 players. Players on the Off-Budget squad are those on Reserve Contracts (maximum 6) and any SMS players that are not included on the Senior squad. The Off-Budget squad can also include players that were designated as Generation Adidas players going into the SuperDraft. It might help to understand the history of the Designated Player. As MLS started becoming more successful, some team owners wanted to be able to acquire higher profile players that could make their teams better, and increase the visibility of their brand. Early in its existence it became known as the “David Beckham rule”, as it allowed the LA Galaxy to make Beckham the first Designated Player. The problem with acquiring these players is that salary cap prevented the teams from being able to offer them a contract that fit in the cap. The Galaxy were not going to sign David Beckham at $300k a year. Many of these players would need contracts exceeding the entire amount allowed for an entire team. So the idea was to allow clubs to “break the salary cap” for two players. It would help the teams, and it would help the league. In order to maintain fiscal responsibility, the teams themselves would be responsible for the salary of Designated Players, whereas the league itself pays the salaries of all other players. So a team can pay a player $7M a year, but it will only count as $435,000 against the salary cap. Eventually, some teams wanted to use their DP slots on younger players and MLS wanted to encourage youth development. So they created the idea of “Young Designated Players” (YDP). For DPs under 23, they reduced the impact on the salary cap. So what does that mean for FM gamers? Well from a functional standpoint, it adds a little to scouting. You can now scout international youth players with the idea that you are not limited by the Wage Maximum. You will also occasionally be approached by high profile players who want to be signed on a Designated Player contract. Just as an example, in one of my games I had Dani Alves and Lucas (Arsenal) on my squad. You can also approach players who are almost or fully out of contract and offer them DP contracts. Senior players will make up the largest part of your squad. Players signed to Senior contracts can make no more than $363,000 per year. Their salaries will count fully against the salary cap, although you will be able to use Allocation Money to “buy down” the impact of their salary against the cap. We will cover that later. Because their salaries will count fully against the cap, these players will be on the Senior Squad. Players who are paid the league minimum salary of $60,000 are called SMS players. Whether or not these players count against the cap depends on how many DPs and Senior players who have on the squad. I already covered how that works earlier, but basically SMS players round out the numbers if your Senior squad has less than 20 players. 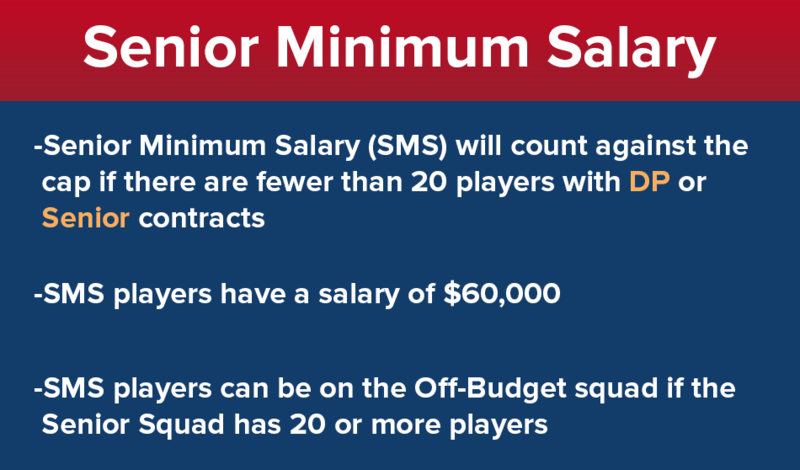 Any SMS players you have after the Senior squad has been filled out will be put on the Off-Budget squad and their salary will not count against the cap. The title of this contract type is probably confusing. It should be said that MLS does not have a Reserve League (anymore). Players registered as Reserve Players simply have a contract below the Senior Minimum Salary, are 24 years old or younger, and are NOT Generation Adidas players. 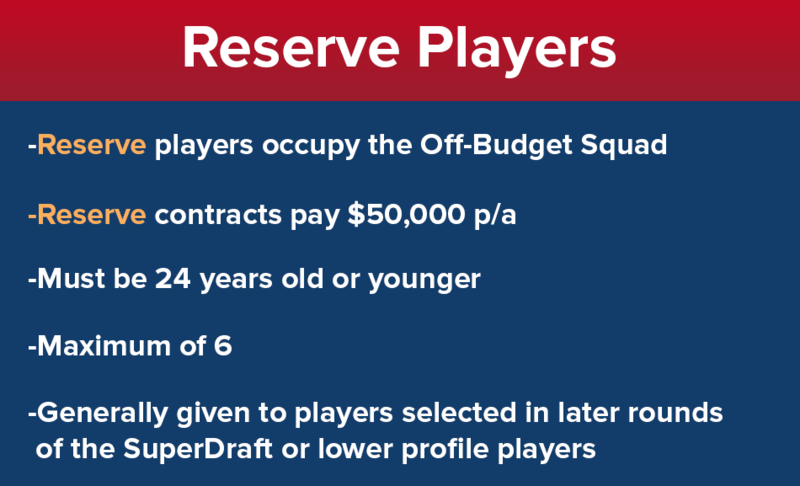 Reserve players are on your Off-Budget squad and therefore do not count against the cap. Most of these contracts are given to players that are drafted in the later rounds and therefore do not demand a high salary. You don’t have to have any Reserve players, however the most you can have is 6. As you might already know, college sports in the United States is very popular. In our country the path for professional sports goes through college. If a high school players is good enough, then a college team will offer them a scholarship so that they can play their sport while also attending class for free. However, in order for these players to maintain their amatuer status and remain eligible for their college team, they could not receive any compensation relating to their play (being paid to play, endorsements, merchandise, etc.). In the early days of MLS, the salaries were far too low to entice players to surrender their eligibility for their college teams. Teams did not want to risk giving up a lot of their salary cap space on players that had never played professionally before. 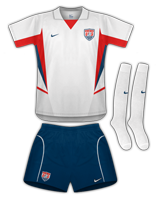 That’s when MLS created the Generation Adidas program (originally called Project-40). Every year, clubs make recommendations to MLS for offering Generation Adidas contracts to specific college players, and usually 12 are selected (although not all players sign the contract and choose to play overseas). The GA contracts are higher than the typical MLS rookie, which encourages players to leave or even forgo entirely their college team and enter the more challenging environment of professional soccer in the hopes that it will help their development. The league also stores money in an escrow account so that if the player’s career doesn’t work out, they can go back to school and finish their degree. GA contracts also do not count towards the team salary cap, so that entices the clubs to take a risk. In Football Manager, the risk factor of drafting a GA player is accurately reflected. Most of the best players will be GA, however not all GA players will be league stars. Jozy Altidore, Michael Bradley, and Clint Dempsey were all Generation Adidas players. However, there are a lot of GA players who didn’t make it in the league. So while GA players aren’t going to hurt your salary cap, you can’t assume that they will be future national team quality just because they’re GA.
Next I’ll cover how MLS handles international players. The easiest way to look at it is that every team starts with 8 International Player slots. In reality, there are a total of 160 International Slots (176 in 2017, or with my file 192 in 2017) that have been distributed to the MLS teams. These International Slots are actually exchangeable assets. 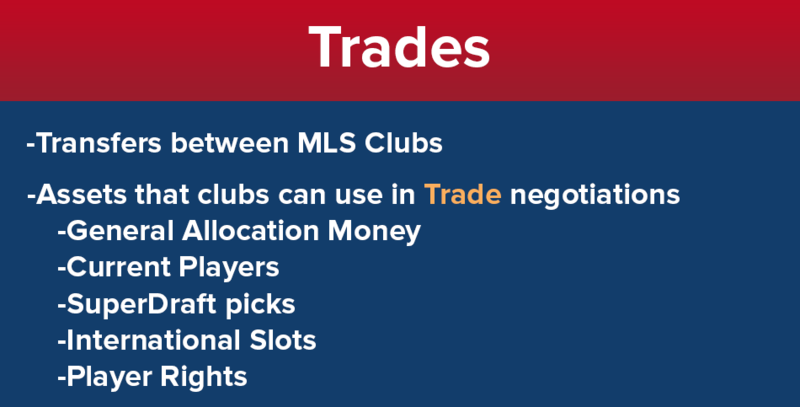 MLS clubs can choose to trade these slots to other teams as part of domestic transfers. MLS teams can trade an international slot for 1, 2, 3, 4 or 5 years, after which they will revert back. International Slots can also be traded on a permanent basis. In the mid-2000’s MLS started getting pressured to take an active role in developing their own talent. The league implemented a rule that stated every MLS club must operate their own Academy. Some clubs take it more seriously than others, and that’s reflected in the game in their Youth Facilities, Coaching, and Recruitment ratings. Next the league had to sort out how to handle signing homegrown players. In the beginning the clubs were only allowed to sign a certain number of players from their Academy per year, but that discouraged the teams from investing in their Academy program. Now the clubs may sign as many Academy players as they want. 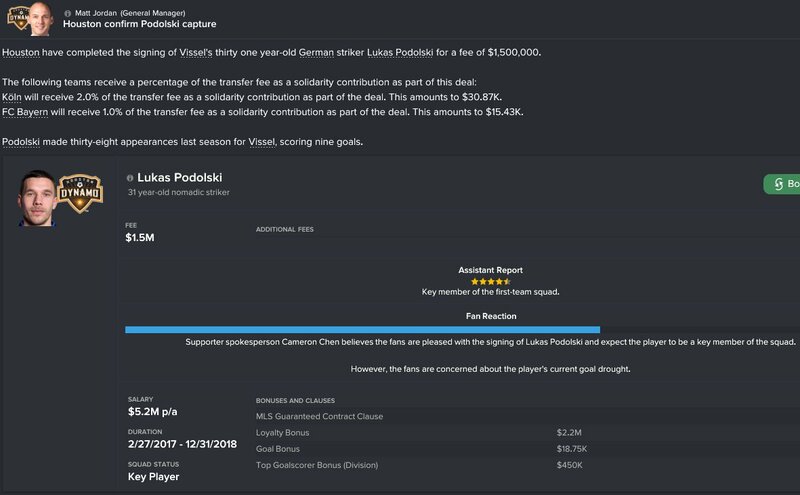 In FM, the truth is that your Academy will not produce many stars, but you can usually sign 2-3 or potential contributors per year. Most of the time they won’t be able to step in right away, but given some time to develop they could eventually be starters. This is actually true to life, as it is very rare that a Homegrown signing walks into the first team immediately. -You have 1 Homegrown on the Senior squad, and 1 on the Off-Budget. That illustrates that Homegrown players on Senior contracts will count against the cap. -7 International players on the Senior squad, and 1 on the Off-Budget squad because they have a Senior Minimum Salary and the Senior squad is full with 20 players, so they will not count against the cap. Obviously, this will all be a bit confusing to an outsider. I don’t expect that reading this will make you fully understand it. However, using it as a reference as you play the game will help as you assemble your squad. It should also be said that each year the Salary Cap, Wage Maximums, Wage Minimums, etc., will likely go up. That is an accurate reflection of real life. Next I will look at how you go about acquiring players in MLS. So here is where playing in MLS is interesting (and probably confusing for outsiders). This only takes place following the 2016 season, but in 2017 the league is adding 2 expansion teams (4 in the file I created). The league wants those expansion teams to be able to compete immediately, so they hold an "Expansion Draft" where the new teams will pick from a pool of players. This pool is made up of players currently on MLS squads that the other 20 teams have chosen not to "protect". Each current MLS team may protect 11 players on their squad, which means they cannot be selected in the expansion draft. Generation Adidas players, Homegrown players and players that have been brought in on loans MUST be on your list of 11 protected players. Your list must also include four foreign internationals, which will not be a problem for me. I have players that fit that category, Juan David Cabezas (loan), Jose Escalante (loan), Alberth Elis (loan), and Memo Rodriguez (Homegrown). So that means I must choose 7 players from the rest of my squad to protect. So I have decide which of my players I absolutely cannot do without, and who am I willing to let go. My young, high potential players are the obvious ones. Mauro Manotas, Romell Quioto, Danilo Rajden, Rafael Ramos, Tomas Martinez, Zach Pfeffer, make up the nucleus I hope to build the club around in the future. The choice for my final spot is a difficult one, because I intend on choosing between DaMarcus Beasley and Ricardo Clark. These are my two team leaders and they're two guys I really don't want to lose without getting SOMETHING in return. I know that there are teams interested in both guys, but in the end I choose to protect Beasley. I need a left back more than I need a DM so that's the logic behind my choice. I watched the draft, waiting to see which of my players was picked. 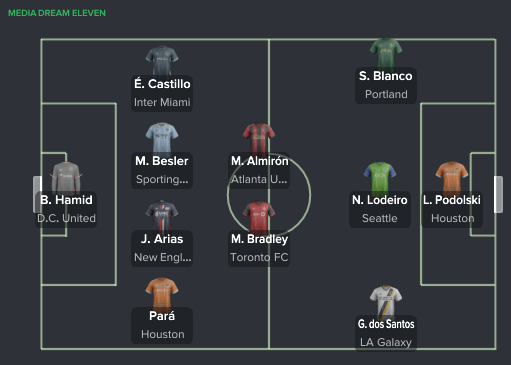 In the fourth pick of the second round, Inter Miami selected my goalkeeper Tyler Deric. Not the ideal player to lose, but it's not like Deric is world class. He's not even that much better than my 2nd team keeper, Joe Willis. It is, however, now a position where I need to find a replacement.